Hanoi (VNA) – The Ministry of Health is maximising efforts to prevent the spread of dengue fever, heard a meeting in Hanoi on August 17. According to head of the ministry’s Preventive Medicine Department Tran Dac Phu, the country has recorded 90,626 dengue infections since the beginning of 2017, a year-on-year rise of 67.8 percent, including 24 fatalities. The capital city of Hanoi is ranked second nationwide after the southern metropolis of Ho Chi Minh City in terms of infections, he said, noting that from January 1 to August 16, 2017, Hanoi recorded 17,027 dengue patients, seven of whom died. 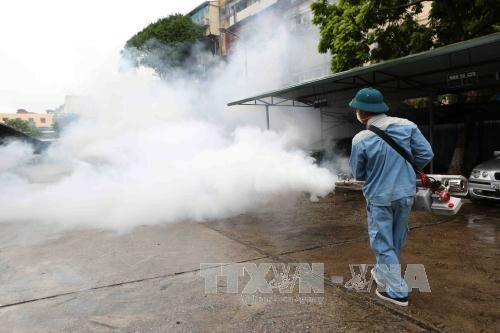 Minister of Health Nguyen Thi Kim Tien ordered an increase of campaigns to spray chemicals to kill mosquito larva, especially at hospitals, schools and construction sites, as well as training courses for health workers on treating dengue fever for adults and children. She asked the Preventive Medicine Department along with the National Institute of Hygiene and Epidemiology and the National Institute of Malariology Parasitology and Entomology to open more training courses on epidemiology for medical stations at grassroots levels.